This is an absolute, must-see interview. Renowned hedge fund manager Kyle Bass joined Hedgeye CEO Keith McCullough for a “pro-to-pro” discussion on China, global recession, and why interest rates may head to near zero by 2020. You’re not going to get better perspective on the Chinese economic blowup risk anywhere else. “When you think about leverage in the system, China has put together the most reckless financial experiment in world history,” Bass says. We have transcribed key takeaways from this conversation between Bass and McCullough below. Click here to watch the entire 1-hour conversation. Keith McCullough: Hi I'm Keith McCullough. Welcome back to another Real Conversation, where it's my pleasure and privilege to welcome Kyle Bass who needs no introduction. It's going to be a great conversation back and forth where we're actually going to let Kyle talk and articulate all the work that you've done over the last couple of years, but also over the course of your career on this topic. First, I want to talk about your growth outlook, but also both the cyclical and the secular growth outlook in China and also the leverage and how that plays such a big part in your analysis. But maybe just start with your current update on the cyclical side of the Chinese problem as you see it. Kyle Bass: Sure. Well, I think as everybody's seen, you've seen a pretty big credit impulse in the first quarter in China from the perspective of credit expansion. The interesting thing is that the stock markets have taken that and run with it. It is really important to understand where China is in the time continuum of its global macro economy. What we believe is if you just take a 50,000 foot view of China Inc, China's running an augmented fiscal deficit (i.e. the government number plus the local government financing number) of roughly 10% of GDP. So they’re running a fiscal deficit of -10%. They will be running a current account deficit from now on. So you have a dual deficit nation with a closed capital account. It's not a dual deficit like the U.S. with a free capital account and also a hegemonic position. You can't run a dual deficit economy with a closed capital account and stimulate the way you've stimulated in the past when you had a positive current account. So anyway, that's where I get to China. You're going to see it turned down. Another thing, Keith, you and I both know you have to take the Chinese numbers with a grain of salt, and maybe a bucket of salt. But just look to China’s trading partners. South Korean exports are down 8% a year over year in March. Germany's Manufacturing PMI was 44.1. That was the worst PMI in Germany since 2012. Japan's Tankan March survey, sentiment of large manufacturers was at a six year low. So China can tell us that they're growing and they're really stimulating, but their largest trading partners are telling you that things just aren't very good. That's something that you at Hedgeye are so good at noticing. McCullough: This is really the question I have for you about this, Kyle, and first of all you nailed it. 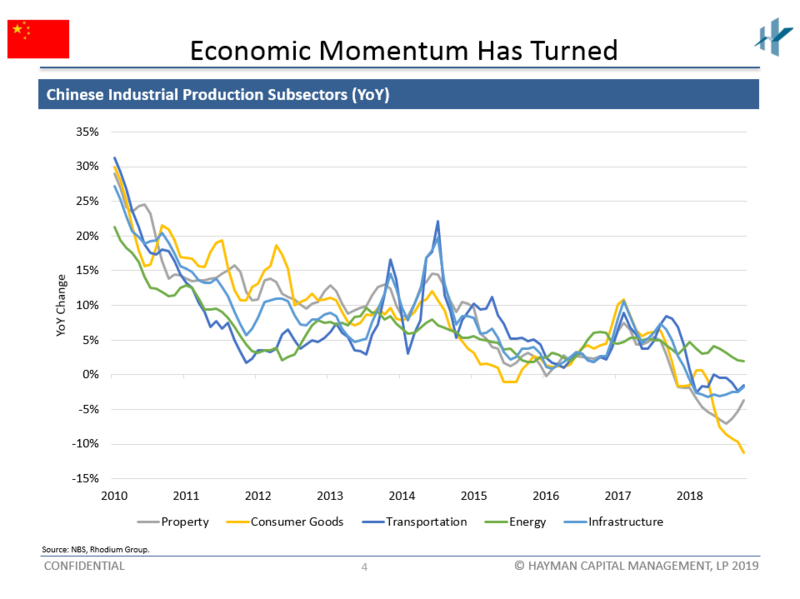 The economic momentum has turned. Some people would say, ‘Okay, great call Kyle but it's all priced in.’ One PMI number and we're off to the races. The scariest data point almost no one is talking about is consumer goods or consumption which is downward dog. Big time. But my question for you is why is it not bottoming? Bass: Can it bottom in the near term? You and I both know, Keith, that in these cyclical moves higher and lower you're going to have aberrations in the data. But I think if you're looking towards the trend, it’s pretty clear. The hope of the globe is that China is just going to go to the gas pedal once again, like they did in 2008 to move the global economy out of the global financial crisis. While we applaud them for what they did in the past, back then they were running a huge current account surplus. Their reserve balance was growing. Their bank credit and credit in general wasn't anywhere near the levels that it is today. So they had a lot of room to go to the gas pedal. What I'm telling you now is if you're running a secular current account deficit coupled with a fiscal deficit that's the largest in the world, bar none in gross terms, that it's really difficult to use your FX reserve balance to acquire the iron ore, the food, the oil and everything else you need to buy that you don't already have as a resource domestically. You can't do that because you're already down to the minimum levels of working capital or FX reserves that you need just to operate your economy. McCullough: I want to nail down the cyclical versus the secular one more time. You mentioned 2008. A lot of institutional clients go back and forth with me and say it’s a lot like 2016 when China injected massive stimulus. I don't agree with that, but I know where it's coming from. If you cue up slide 93 in the current macro deck, you can see secondary industries in China, heavy equipment, empty cities, et cetera. This is where the Chinese effectively stimulated on the infrastructure side of the economy. 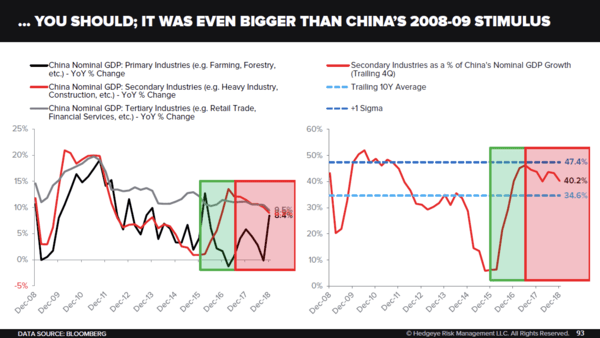 You can see, to Kyle's point, that the growth from secondary industries in China was almost 0% growth. They then stimulated like never before and secondary industries as a percentage of China’s nominal GDP growth went to almost 47%. Can they do it a third time? So 2008, 2016 and 2019? Bass: I don't know if I can tell you they can or can't do it for three or four or five months. Again, the difference between today and 2016, is that in 2016, China was running a massive current account surplus, right? So the current account deficit now means they are spending more than they have coming in from an operating perspective. McCullough: Yeah. That's the critical point. Pick any country that's running twin deficits and seeing economic growth slow. When you see economic growth slow down on top of a lot of leverage and twin deficits there's not a country in modern times that hasn't blown up. Look at Turkey or Argentina. 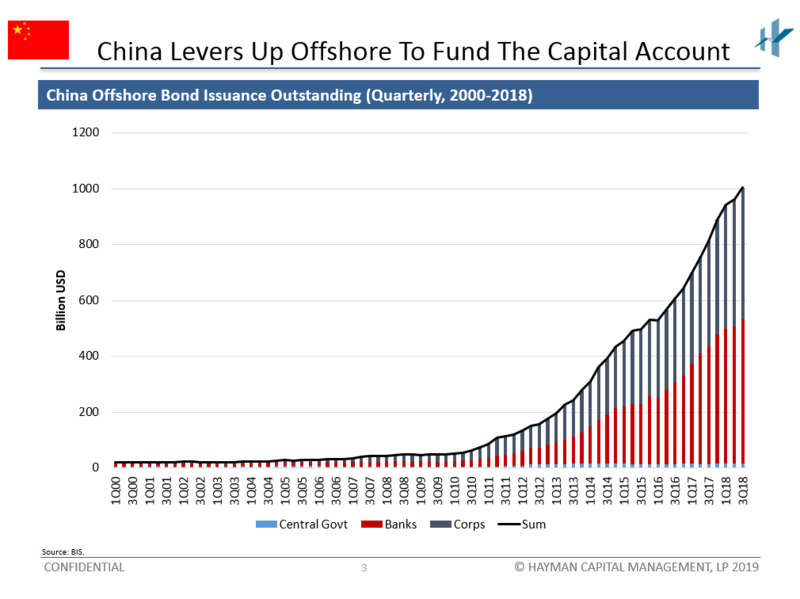 Actually, on your next chart, can explain that in terms of actually funding of this capital account and how they're using the bond market to do so? Bass: Sure. So this is from the Bank of International Settlements through Q3 of last year. And if you notice, China didn't really start borrowing in earnest until 2014 when their current account was headed towards zero before again crude oil collapsed. And now you see they borrowed a little over a trillion dollars. They borrowed $250 billion alone last year. Bass: So, you mentioned Turkey and Argentina’s twin deficits. I know it is comparing an apple to an orange, but China is starting to look like a traditional Emerging Market, right? They're running twin deficits and they're borrowing in dollars. That's the formula for an EM blow up, especially if you have a closed capital account. McCullough: Can you contextualize things on the leverage side? You've got $48 trillion in China. Can you contextualize that within the context of both Chinese history and the U.S.? Bass: So going into the U.S. financial crisis, this was key. The U.S. banking system had about a trillion dollars of equity in the system and we had $17 trillion on balance sheet in banking assets and we had, it call it, another $5 or $6 trillion in off balance sheet, if you looked at Fannie and Freddie and the non banks. So when you think about it, we were at about 1.3 times banking assets to GDP in total. We lost about $800 billion in the financial crisis. So through common and preferred equity injections throughout the crisis, we essentially recapitalized our entire banking system. When you look at China today, China today is north of, and again, we use the current spot rate of the Chinese currency to the U.S. dollar. They have a little over $50 trillion worth of RMB of banking assets on an economy of $13 trillion. On a bank equity position of about $2.6 trillion. So if you look at some of the reports of non-performing loans in China, the IMF recently said about a year ago that they believe the actual non-performing loan number in China as well, north of 7%. Well you go 7% of $50 trillion and you get to $3.5 trillion in non-performing loans. That's what the IMF conservatively estimates. And then you ask, what will loss given default be right? It'll be at least 80 cents on the dollar for all the crap they've been lending to. So they're going to wipe out more than all of the equity in their banking system. And by the way, it's probably much worse than that. So when you think about leverage in the system, China has put together the most reckless financial experiment in world history. When you think about the size of the credit impulse within their system, the US economy is roughly 20 trillion. There's is roughly $13 trillion. Their banking system is north of $50 trillion. Our’s is $20 trillion. So just think about it. I know they're smart over there, but China has only been at this capital markets thing for about 20 years at most. We've been at it for over a hundred and look at the predicament the U.S. into in 2007. Click here to watch the entire 1-hour interview with Kyle Bass.